This was such a fascinating and frustrating NCIS episode, all at once. Turned out that Parsons wasn't nearly as altruistic about the law as he portrayed himself. Tony told Gibbs about evidence they found, which proved Parsons was a sleazy narcissist who kissed upper management rings while doubling as a blackmail artist. As the hour went on, Parsons finally put his finger on the one thing that could bring Gibbs down: his revenge murder of Pedro Hernandez, the man who killed Gibbs' wife and daughter. The only problem was the missing forensic report from Abby - which Parsons accurately figured out was conveniently lost in order to cover up Gibbs' involvement. As more evidence piled up (I knew Parsons didn't believe Ziva's story that Bodnar had "lost his footing") it seemed that the team - and especially Gibbs - were playing that old Star Trek "impossible test" scenario. It truly looked like there was no way out, and I wondered how the writers were going to bring Gibbs and the team back on safer ground in a logical and believable way. I think they had Gibbs giving us hints throughout. He was going to fight Parsons but not by his nemesis' rules. He even refused to take advantage of Tony's intel regarding Parsons. And the whole way through he seemed pretty confident that he'd never see the inside of a court. Two things come to mind when someone is that confident: either he has information that will make everything crystal clear such that no judge would hear a case against him (and that's not true: he did murder Hernandez)... or he could find another way out. Perhaps make a run for the border (unlikely) or find some other way not to be present when the time for court arrived. I must admit: that latter option had me a little worried. The other thought that crossed my mind has to do with a concept some employ when it looks as though they can't win: you can't lose if you refuse to play. Ziva: Gibbs you cannot do this alone. You have to let us help. Gibbs: Hey - it is not your job! Meanwhile, the irradiated severed head of a Marine showed up on his wife's doorstep and the team had to leave Gibbs while they investigated it. I immediately thought: "why would the writers introduce another case right now, right when we're all concerned about Parsons' witch-hunt?" Turns out this case has everything to do with what's going on with the team, as was pointed out to Vance in one of the many NCIS quotes from this episode. We still don't know exactly how the dead Marine figures into it - just that Tom Morrow assured him (us) that it does. We learned that it was the CIA who took advantage of the execution of Eli David by killing Arash Kazmi - so that they could blame it on Bodnar. So that's one mystery solved. Only 99 more to go. The CIA wanted to distract Iran and Israel from seeing the "real threat, here on home soil" as Morrow put it. Why? What's the real threat? How does that threat tie into Israel and Iran? Morrow alluded to a tie between the killing of Kazmi and Eli David, the dead Marine and NCIS' current problems (though he assured Vance that Parsons knew nothing about any of it and was proceeding on his own steam). What exactly is the connection? How does sending the severed head of the Marine to his wife play into any of it? Why was the head irradiated? Tony suggested that it sends a strong message to "back off" - by why the radiation? Couldn't the head itself be the message? And who sent it? What's more threatening than Iran and North Korea? Was Tom Morrow alluding to terrorist cell activities, and that they're more of a threat because of their immediacy? Near the end, we saw a plan being hatched, offered up by Tom Morrow, that would, as Vance indicated, give them a clean slate. Right before walking into Vance's office, Tony, Ziva and McGee all agreed that if the situation were reversed, Gibbs would do the same for them. They then offered their resignations to Vance and "took responsibility for the accusations" so that Gibbs would be cleared. Only he isn't cleared, is he? The investigation into his activities is merely postponed. And note the wording from Vance: the team took "responsibility for the accusations," not "took responsibility for the crimes." That's important, as it makes everything grey instead of black and white, as Parsons would prefer. He can't build his career advancement on "grey." He needs a solid win. Finally we flash-forwarded to four months later with Gibbs working on his assignment for JSOC. He's in a darkened room overlooking a street somewhere, and there's a wounded man in there with him, urging him to "do it." He goes to the window and sets himself up with a sniper rifle and puts Tobias Fornell in his sights. Fade to black and - bang! Palmer and his wife are adopting! Tony and Ziva had another "moment" and so for now it looks like Tony has waltzed right back into the friend zone. Later, when McGee told him to stop correcting Ziva, she said it's okay McGee, I can handle him myself and Tony replied yes she can. That sound you hear is the laughter of the writers, having fun with us. The entire team found another spot to have a group meeting - this time in the elevator, and away from prying bugs. Dangerously hints at claustrophobia if you ask me, even though Abby enjoyed it and wanted to make it a regular occurrence. 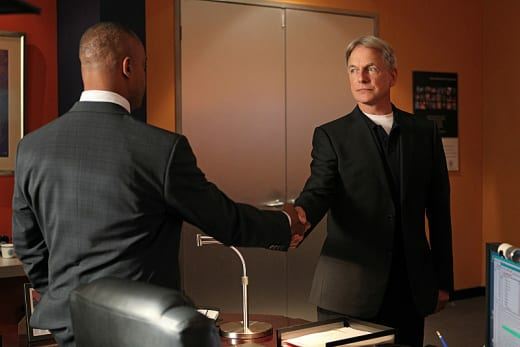 Gibbs seems to be struggling with guilt over the death of Vance's wife - for which his subconscious dredged up the ghost of Mike Franks, both in the waking thoughtful world and in his nightmares. Or, more likely, it's guilt over all of the deaths that have happened on his watch. Hence the "damned if you do" speech. Lots of purging of documents in this episode wasn't there? Vance shredded Abby's damning report on Gibbs (finally!) and Gibbs found reason to burn a bunch of documents having to do with Franks. While unsure about the contents of those files, we need to note that Mike Franks lived for a while in Mexico and was involved with the Payloma Raynosa story. Given Parsons' keen hunting nose, maybe it was better to burn every hint of the Mexico operation. We still don't know what Gibbs hid in his basement when Tony arrived. Although we do now know that he built a sturdy and warm cabin out in the middle of nowhere. Man that looked inviting, didn't it? Our Criminal Minds Round Table is up! Come over and let us know what you think about what we talked about. 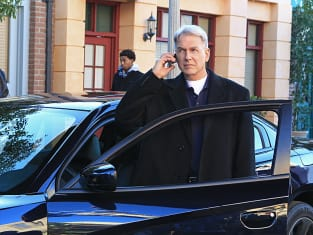 What are your thoughts on the NCIS Season 10 finale? Do you think Gibbs actually shot and killed Fornell? What do you think Ziva, Tony and McGee will do, now that they're not working for NCIS? More importantly, what are Morrow's plans for bringing them back? What are your thoughts on the "real threat" that he mentioned?